Thanks to Mark Zuckerberg's little invention called Facebook, I can now share much more history regarding Wintrode's Garage in Littlestown, Pennsylvania, which was the subject of a post yesterday. 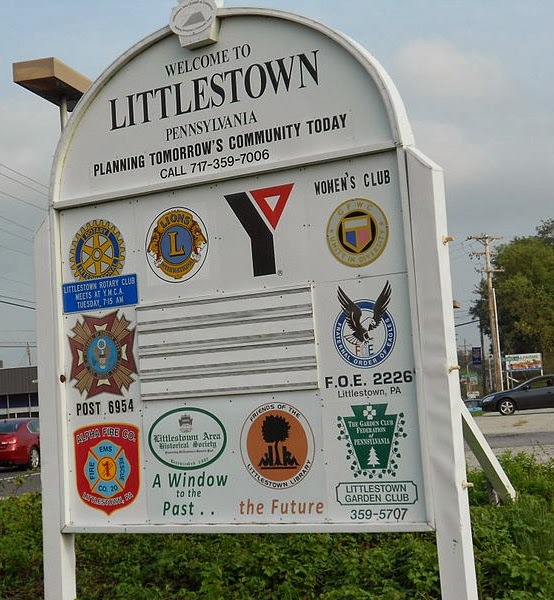 I asked folks on the "If you grew up in Littlestown, you remember" and the "If you grew up in Hanover, Pa you remember" Facebook groups for their memories about Wintrode's, and I received a bonanza of responses. Here are some of them, lightly edited. I don't mean to get all nostalgic, but they certainly speak to a different era in America and its small-town life. "Wintrode Buick was in business since probably the 1940s. My parents bought a lot of Buicks from them over the years. Clinton Wintrode and his wife were the owners. Later, Emerson (Buck) Muller, husband of their daughter Arlene, ran the business. And at some time later, Muller's son Ray was involved in it. They sold Buicks, and when Buick was marketing Opels, they sold them, too. I took my driver's test in a 1965 Buick Special station wagon that was purchased there. They had a service department, and I remember a mechanic named Leroy Wildasin. He used to tell me jokes when I was a kid. Also, Wintrode's had an ice cream case that sold Folmer's Ice Cream — I remember dreamsicles on a stick. Ah, Mrs. Wintrode's first name was Mary. A sweet lady. It was a family business and they all worked at the business. ... I see the phone number is 170. I remember getting a dial phone in Littlestown in the very early 60s. These short numbers were before the dial!" "I can tell you that my parents got many cars from them. I also got my first car there, a used Chevy Vega. The worst car you ever want to have but that wasn't their fault, it was a Chevy. "My dad Leroy worked for all three generations as their bookkeeper at different times and retired from Wintrode's." "I remember that Clinton and Mary Wintrode owned the dealership back in the day. It was a big time in Littlestown and other towns when the 'new' year vehicles were uncovered. The vehicles would arrive all covered with canvas on the carrier and were not on display until the specified day. Everyone one made it a point to stop in the dealership to drool over the cars. They would have an open house type of celebration. It was a big time in our small town. The other dealership was Basehore Ford Garage on East King Street." "I can tell you that the founders of the garage were Clinton and Mary Wintrode. I am not sure what year Wintrode Garage moved from South Queen Street To North Queen Street. I remember going to the garage with my dad back in the 1950s. Wintrode's always made everyone feel like family! They had a lot of chairs in their showroom. My dad bought many cars from them." "My dad Irvin was the body shop man at Wintrode's from the late '60s to mid '70s and we rented a house right behind the garage from Clinton and Mary Wintrode on Prince Street." "I'm a teacher at the elementary school. When my car needed service, all I had to do was make an appointment and then leave the keys under the seat when I parked it in the school parking lot. The guys from Wintrode's would come and get it during the day, fix it, drive it back down to school and park it in the lot, and leave the keys in it and the bill on the seat. It was great service!"